Portland-area nonprofit says it will extend state contract through January to ease patient concerns. FamilyCare, the nonprofit care organization for 115,000 Portland-area low-income Oregon Health Plan members, says it is ready to extend its contract with the state to the end of January to minimize harmful disruptions to patient care. 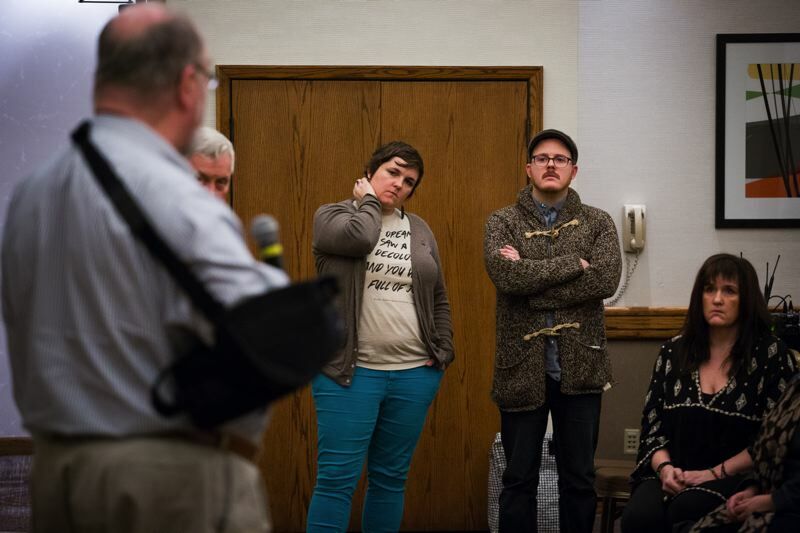 The change of heart follows a dramatic meeting Wednesday night in Portland. There, at the Doubletree Hotel, dozens of FamilyCare providers expressed fear and uncertainty to the organization's management about their fragile clients — some saying flat out that if FamilyCare left OHP as planned by Jan 1, people will commit suicide over fear of losing their provider or coverage. For FamilyCare to close so abruptly rather than operating temporarily while spending down reserves would be immoral and unethical, several said, challenging CEO Jeff Heatherington to reverse what he conceded was an "ornery" refusal to agree to a temporary extension proposed by the state. Relenting, Heatherington told the audience he he would bring the idea to his board Thursday morning. "I offered to extend the contract to ensure the transition of the patients. and we have agreed on a 30-day transition," said the FamilyCare CEO late Thursday morning, "So we will do what we can get everybody moved." On Thursday afternoon Oregon Health Authority Director Pat Allen called the extra time valuable to provide a smooth transition and said Health Share of Oregon is accelerating its efforts to sign up providers now with FamilyCare, to help their patients adapt. Both sides have confirmed that state will pay FamilyCare $5 million as a fee to assist with the transition. Heatherington said the potential impact to patients was the main factor involved in the nonprofit's change of course. "We'll still lose money, but that's not the point," he said. Two Republican lawmakers, Rep Julie Parrish of West Linn and Rep. Cedric Hayden of Roseburg, sat through the meeting and urged providers to keep contacting their lawmakers in the hopes of keeping FamilyCare in the market on a more permanent basis. Contacted by the Tribune on Thursday morning, Allen said, ""we have never left the negotiating table. We and the governor offered a short-term contract extension to assure continuity of care for people multiple times over the past 10 days. We are grateful that Family Care, by whatever means, is now willing to consider this offer." Heatherington said negotiations to keep the FamilyCare in the OHP throughout all of 2018 are not going anywhere, saying the previous impasse over rates had not eased. In related news, on Thursday morning Parrish sent a plea to Democratic leaders of the Oregon Legislature to hold a special one-day session to try to keep FamilyCare in business, citing the meeting. "The chaos of shutting down one of the state's oldest and largest provider networks is palpably real amongst the practitioners who were in attendance, particularly those in the behavioral health community," she said. State officials have said that patients can stay with their providers for 90 days following any departure from OHP by FamilyCare. Eventually, most FamilyCare members will be transitioned over to Health Share of Oregon, the other organization serving Portland-area Oregon Health Plan members. FamilyCare has said it will lay off 250 employees effective upon its pull-out from the Oregon Health Plan, and another 70 over the following six month. Some providers at the meeting Wednesday night predicted care will suffer and clinics will be forced to go out of business because of FamilyCare's demise, hurting patients' access to care. FamilyCare had paid relatively high reimbursement rates to providers for care, saying it led to better quality care and reduced hospital costs.